This document provides a high-level overview of building a custom skill. For step-by-step guide, see Steps to Build a Custom Skill. For samples and templates, see the Alexa GitHub organization. Is a custom skill the right type of skill for what you want to build? See Understand the Different Skill Models to learn about other options like the Smart Home Skill API. Also, be sure the skill you plan to build complies with all of the Alexa Skills Kit content policies. A set of intents that represent actions that users can do with your skill. These intents represent the core functionality for your skill. A set of sample utterances that specify the words and phrases users can say to invoke those intents. You map these utterances to your intents. This mapping forms the interaction model for the skill. An invocation name that identifies the skill. The user includes this name when initiating a conversation with your skill. If applicable, a set of images, audio files, and video files that you want to include in the skill. These must be stored on a publicly accessible site so that each item is accessible by a unique URL. A cloud-based service that accepts these intents as structured requests and then acts upon them. This service must be accessible over the Internet. You provide an endpoint for your service when configuring the skill. A configuration that brings all of the above together so that Alexa can route requests to the service for your skill. You create this configuration in the developer console. For example, a skill for getting tide information might define an intent called OneshotTideIntent to represent the user's request to look up tide information for a particular coastal city. (In this example, the italicized words form the sample utterance you have defined, while the invocation name is shown in bold). The user's speech is streamed to the Alexa service in the cloud. Alexa recognizes that this request represents the OneshotTideIntent intent for the "Tide Pooler" skill. Alexa structures this information into a request (specifically an IntentRequest in this example) and sends this request to the service defined for Tide Pooler. The request includes the value "seattle" as the "City". 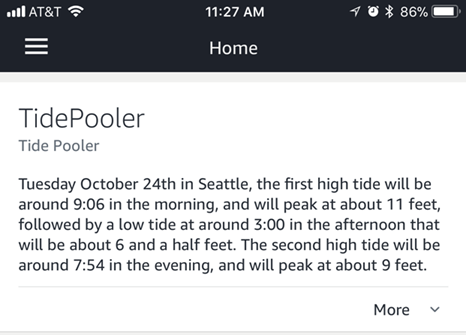 The Tide Pooler service gets the request and takes an appropriate action (looking up tide information for the current date in Seattle from http://tidesandcurrents.noaa.gov/). Tide Pooler sends the Alexa service a structured response with the text to speak to the user. Alexa, Ask Recipes how do I make an omelet? Users may use this option if they don't know or can't remember the exact request they want to make. In this case, the skill normally returns a welcome message that provides users brief help on how to use the skill. 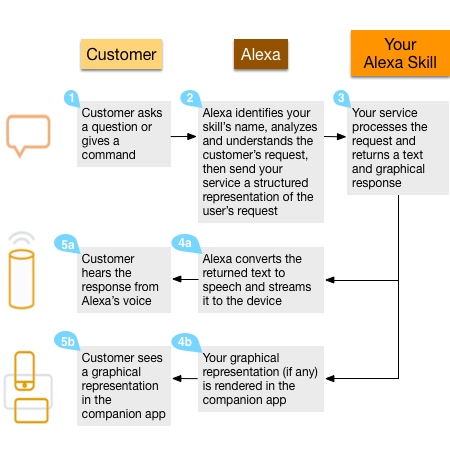 In the above examples, the bolded words are defined by the Alexa service, while the italicized words are sample utterances defined for the skill. The app displays skill detail cards for all published skills. Users review these cards to learn what your skill does and how to use it when deciding whether to enable your skill. You facilitate this by providing useful information about your skill when preparing it for publishing. The app displays home cards that describe or enhance the user's voice interactions with Alexa. Users can view these cards later, to get more information about the interaction or refresh their memory about Alexa's response. Your skill can include content for these cards in your responses. For example, the Tide Pooler skill sends a home card containing the tide information the user asked for. The home card gives the user a way to view the tide information without making another voice request. You can also create a skill that incorporates voice, screen, and touch interactions for Alexa-enabled devices with a screen. See Display Interface Reference. Your skill may use audio files with AudioPlayer. Skills that are designed for an Alexa-enabled device with a screen may also use images and video files. Any such external resources must be available on a publicly accessible website. Each item is referenced by a unique URL that uses HTTPS. You can host your service in AWS Lambda or as a web service hosted on your own endpoint. AWS Lambda (an Amazon Web Services offering) is a service that lets you run code in the cloud without managing servers. Alexa sends your Lambda function user requests and your code can inspect the request, take any necessary actions (such as looking up information online) and then send back a response. You can write Lambda functions in Node.js, Java, Python, C#, or Go. This is generally the easiest way to host the service for a skill. Alternatively, you can write a web service and host it with any cloud hosting provider. The web service must accept requests over HTTPS. In this case, Alexa sends requests to your web service and your service takes any necessary actions and then sends back a response. You can write your web service in any language. Next: See all the steps to build a skill. Get the Alexa Skills Kit SDK for Node.js. See more Node.js samples and templates in the Alexa GitHub organization.